On Friday I shared some of the cards I made with the fabulous Lots of Happy Card Kit and mentioned that the kit also includes a couple of floral stamps. So today I decided to experiment a bit with them. I'm not 100% happy with this card but it was good practice! 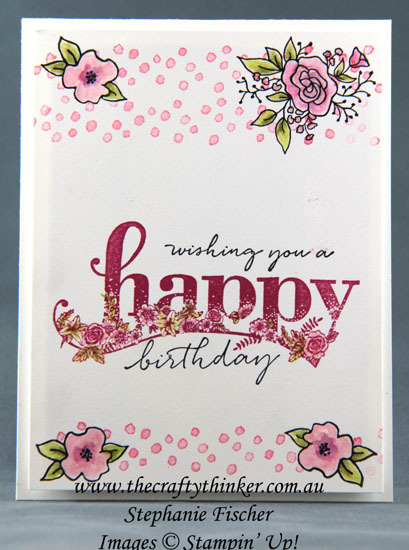 It also uses a couple of other new product from the 2018 Occasions Catalogue - the Happy Wishes Stamp set for the greeting and the Petal Palette stamp set for the dots. Both of those stamp sets are ENORMOUS, containing 15 and 16 stamps each! The Happy Wishes stamp set is one of the freebies that will be available during Sale-A-Bration. If I were to make this again, I would use black ink for the large happy greeting and Rose Red for the script above and below that. I used the watercolour pencils from the card kit and blended the colour with an aqua painter. I popped the decorative layer up on Stampin' Dimensionals for a bit more interest. If you'd like to receive a copy of the Occasions Catalogue (live in Australia and aren't a Stampin' Up Demonstrator), contact me and I'll send one out.